How did you first get involved in rugby? My brother was playing for the minis at Maidenhead and me and my sister, Ruth, were sat on the side. We asked to play and got into it through that. I was five then and when it split to girls’ rugby, we moved to Reading for U15s and U18s. Did your sister help motivate you? Ruth’s two years older, played flanker and I was following in her footsteps. She played in the Premiership and for England U20 before me. We’d motivate each other. She had a serious injury and just plays socially now. Have you always played wing? We struggled for numbers up to U18s and I played a bit at fly-half – not by choice! – but I’ve been on the wing since U18s. Now that I’ve learnt the position I love it. I always used to think the wingers were the fast or skinny people, but it’s very tactical. I’ve picked up so many things about working as a back three, like the pendulum and so on. I used to be into swimming. I stopped in the lower sixth because I realised I couldn’t do swimming and rugby, and I enjoyed rugby more. It’s the team thing. With swimming, you’re training to better yourself. In rugby, when you’re doing fitness or in the gym, it’s to help the team get better as much as yourself. When did you link up with Wasps? When I turned 18 I could join a women’s side and Wasps were the nearest Premiership side, plus my sister played there. I love it – it’s like a family. Giselle (Mather, director of rugby) is as good at challenging someone who’s just picked up a rugby ball as she is with someone who’s played for years like me. She’s incredible. Is it exciting to have Danielle Waterman at Wasps? I’m a bit fan girly! She’s coached me before and having someone like her in the back three is great. She gets me to think about different options – she has so much knowledge. To stay fit! And enjoy what I’m doing. I’m studying mechanical engineering at Imperial so I have to put time into that, but I want to enjoy my rugby and get as much experience as I can. RW Verdict: Last season was a tale of injury and illness (glandular fever) for Dow, but she’s making up for lost time this term. Her form earned her an England call-up for the series against Canada and she scored a brace on her Test debut. 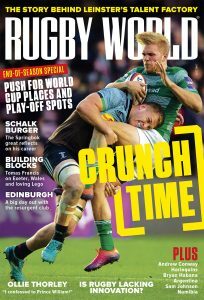 This article first appeared in the January 2018 issue of Rugby World.